I am always completely empathetic to those parents out there who's babies and toddlers are waking 2 or 3 times a night, keeping them awake. I've been there. We've all been there. We'll all be there again...and again over their pre-adolescent years. Getting our babies to sleep through the night is the gold dust of parenting - we're all searching for that magic ingredient. When we first had Jake the hubby and I were desperate to know the sleep secret too, as Jake was crying for food every 3 hours from when we started, in every 24 hour period. It was getting to be exhausting and I really couldn't see how we could carry on with this, knowing I didn't have more than 4 months off work on maternity. 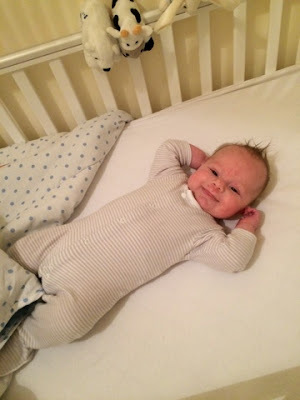 I discovered Gina Ford's Contented Little Baby routine and I haven't looked back. I blogged about our discovery and how we cracked it here, and also how we cracked the issue of Jake self-settling and self-soothing here. 7am - wake up, change nappy and get dressed. Play time! 8am - 7oz milk, wind him - play time! 10am - wake up, change nappy and play time! 11am - 7oz milk, wind him - play time! 12:15pm to 2pm - change his nappy and nap time up until 2pm. 2pm - wake up, 7oz milk, wind him, change nappy and play time! 4pm he can have 30 minutes sleep before 5pm. 5pm - play, bath time every other night, read a story, listen to music. 6:15/6:30 - 7oz milk and then in bed and asleep by 7pm. 10:20pm - gentle wake up, change nappy and feed 7oz milk. Back to bed and sleep for 11pm! Every day is the same - the only differences we have are the LTN - some times he has as little as 45 minutes here and is up before 2pm. I'm really glad that I found CLB and that I persevered through those first few difficult days; it has been soooo worth it! What's your day look like?